Rare Books & Manuscripts recently acquired this lovely little copy of An Anthology of Modern Verse. While the title was first published in 1921, this particular book is a twenty-fourth edition, printed in 1929. 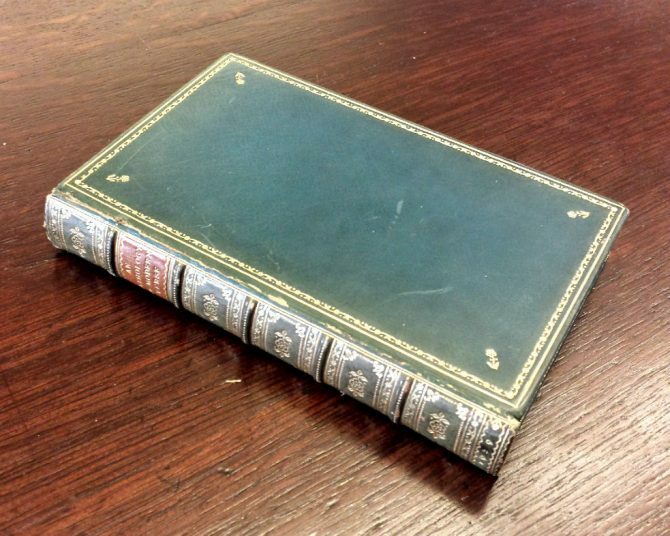 So, what makes this collection of classical English poetry compiled by British educator Sir Algernon Marshall Stedman Methuen special? When the pages of the book are slightly fanned out, a charming watercolor landscape of a grand English manor estate is revealed. 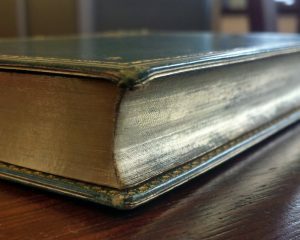 Commonly known as a “fore-edge painting,” the scene is hidden under a layer of gilding when the book is closed. Artists achieve the effect by securing the book in its fanned position into a wooden press. Once stable, the exposed inner edges of the pages, almost like staircase steps, are lightly painted with an almost dry brush. The time-consuming process is completed in stages to avoid over dampening and warping the paper. The decorative technique peaked in England in the late 18th and early 19th centuries, yet it continues today by artists who usually work older pre-gilded books with fine bindings. 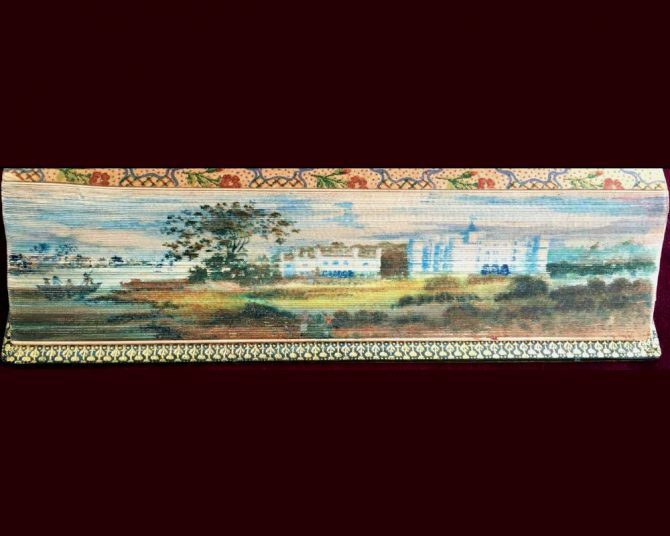 Typically, early fore-edge painters did not sign or date their work and many remain anonymous. 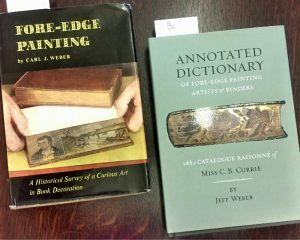 However, the Annotated Dictionary of Fore-edge Painting Artists and Binders, written by rare book and fore-edge expert Jeff Weber, is an authoritative resource on identifying painters and binders of specimens held by collectors and libraries the world over. Weber’s grandfather, Professor Carl J. Weber, wrote two important books on the history of fore-edge painting himself. 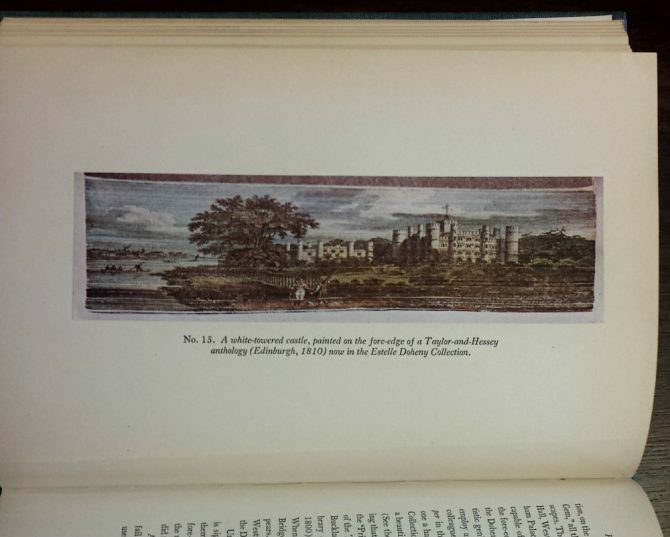 After reviewing the elder Weber’s A Thousand and One Fore-edge Paintings and Fore-edge Painting, I was delighted to come across a painting on a much older book similar to that on An Anthology of Modern Verse. Although landscapes are common subject matter, it was an unexpected surprise. More fortuitous still is the fact that Carl J. Weber was also a renowned Thomas Hardy scholar, one of the writers whose poetry appears in the anthology. If you would like to visit Rare Books & Manuscripts at Central Library to see these books, please call us at 314-539-0370 to schedule an appointment.